The caravan site we stayed in over Easter was just outside Llandecwyn near Talsarnau. The new village of Llandecwyn is strung along the road from Maentwrog to Harlech, and comprises of a few houses, farms and a chapel. But the history of Llandecwyn goes back much further than the relatively modern houses currently visible. Immediately behind our caravan was a wood with an enticing footpath disappearing up the hill. And so of course like Hansel and Gretel, Aunty and I headed off into the wood hoping not to find any witches. We came across and old road and followed this up to Llyn Tecwyn Isaf (Lower Lake Decwyn), a small sheltered lake hidden among the hills and trees. 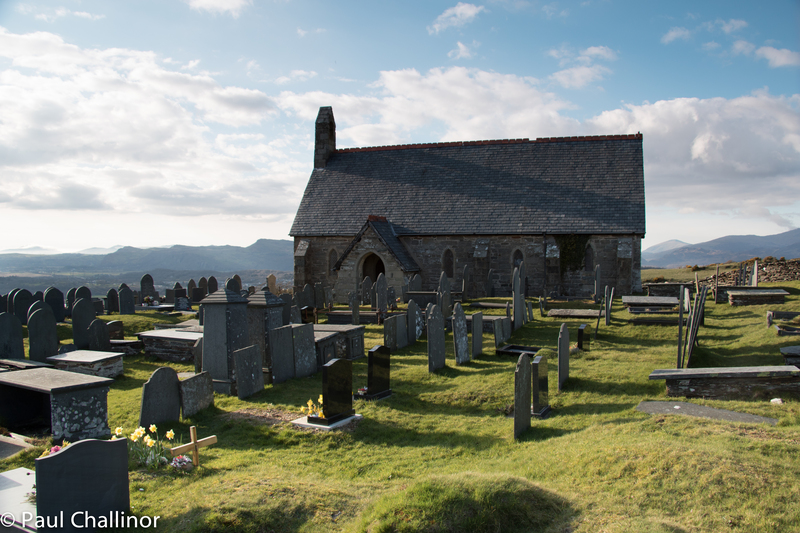 The present Church of St Tecwyn is almost wholly of 1879-80, but replaced an earlier building on the site. The churchyard walls and lychgate predate this rebuilding of the church. 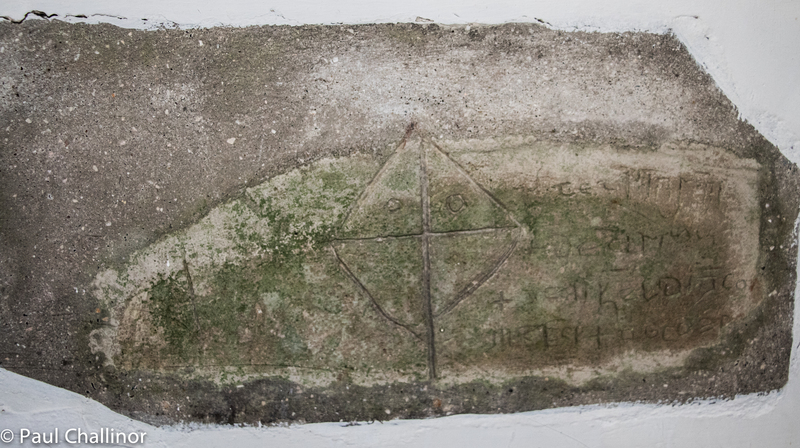 The walls are difficult to date, but the lychgate is probably C17 or C18. The date may be 11th Century. When you look closely it is possible to see that the letters are not cut by chisel, but have been are created by a series of dots, possibly pecked into the stone by a nail or other sharp point. 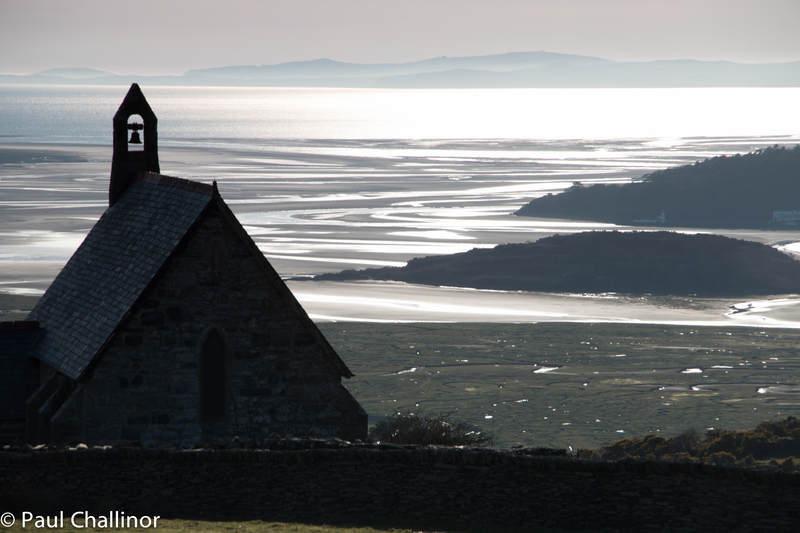 This is the only church named in honour of St Tecwyn, his brother Twrog has the only church in Maentwrog, whilst their other brother Tanwg is commemorated by the ancient church in the dunes at Harlech, and its replacement as the parish church of Harlech in the town. The view towards the sea and the Afon Dwyfor estuary and the Lleyn in the distance. Thank you for these photographs. My 4Grand mother’s brother was the Minister there, Owen Jones. I’m glad you like them it’s a special place. In fact I was up there again yesterday. Next Next post: Clyne Gardens. Welsh 100 – No 23.